X-ray emission is an excellent indicator of a star's magnetic field strength. Magnetic fields on the Sun and stars like it are responsible for much of their behavior, including the generation of powerful storms that can produce spectacular auroras on Earth, damage electrical power systems, knock out communications satellites, and affect astronauts in space. As discussed in our latest press release, new research relying on data from NASA's Chandra X-ray Observatory is helping astronomers better understand how these magnetic fields are produced. By comparing the X-ray emission, an excellent indicator of a star's magnetic field strength, between low-mass stars and the Sun, a pair of astronomers was able to find an important clue about how stellar magnetic fields are generated. The Sun and stars with approximately the same mass have a divided internal structure with an inner radiation zone (energy moves outward) and an outer convection zone (the energy circulates). Stars with significantly lower masses, however, do not have such a differentiated structure. 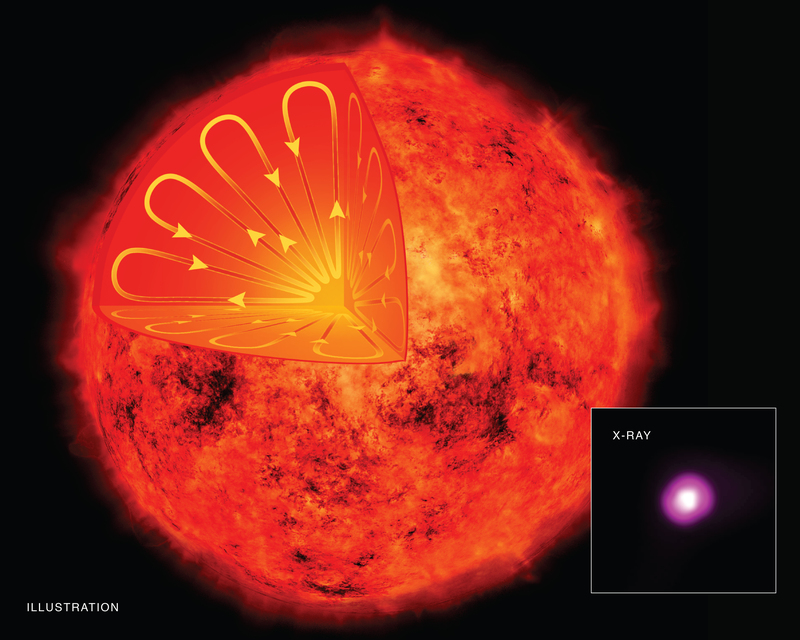 Instead, the process of convection is dominant throughout the star, which is depicted in the artist's illustration in the main panel of the graphic. The researchers in this latest study looked at four low-mass stars - two with Chandra and two with archival data from the ROSAT satellite - and found their X-ray emission was similar to that of stars like the Sun. 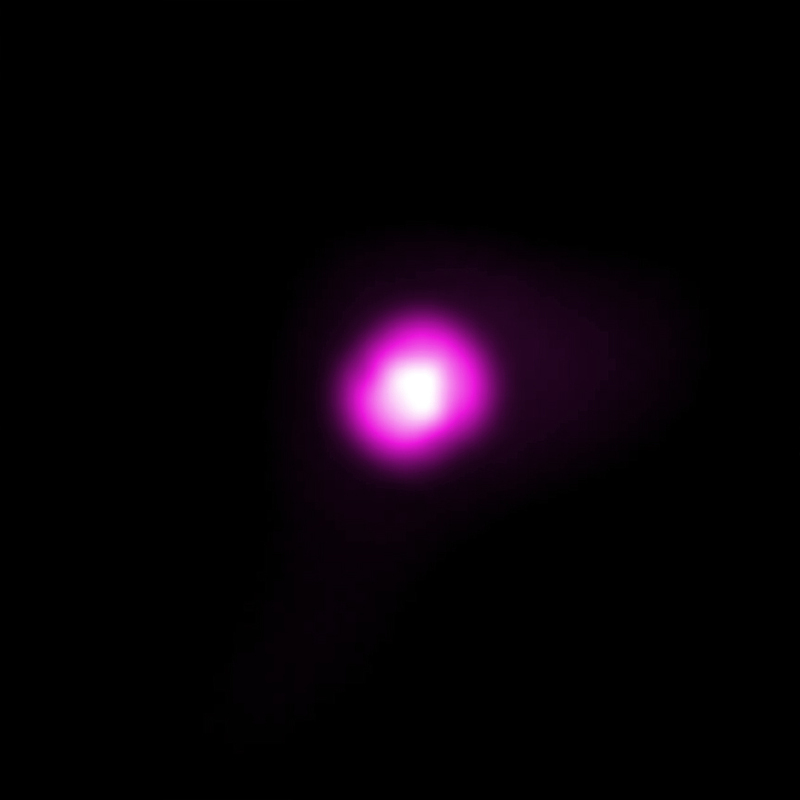 (The inset in the graphic shows Chandra's data of one of these low-mass stars, GJ 3253). This result was surprising because many scientists think the boundary between the radiation and convection zones in the Sun and Sun-like stars contributes to the strength of its magnetic field. If stars without such a boundary have relatively powerful magnetic fields, then this theory may need to be re-examined. A paper describing these results by Wright and Drake appears in the July 28th issue of the journal Nature and is available online. NASA's Marshall Space Flight Center in Huntsville, Alabama, manages the Chandra program for NASA's Science Mission Directorate in Washington. The Smithsonian Astrophysical Observatory in Cambridge, Massachusetts, controls Chandra's science and flight operations. Coordinates (J2000) RA 03h 52m 41.70s | Dec +17° 01’ 05.70"
Observation Time 5 hours 45 min.